After all the fun we had at Tampa Bay Comic Con last Saturday, Ally and I were ready to have some more at the Indie Bookfest, held right here in Central Florida near the Downtown Disney area. It was a two day event, but unfortunately, we weren't able to attend on Friday, when the panels were held. We were still excited, though, to go to the public book signing on Saturday, which was free! Ally and I were beyond excited to meet Maria V. Snyder, author of the awesome Study series. It was Ally who introduced me to the books by constantly telling me: "Poison Study. READ IT!!!!" I cannot emphasize how relentless Ally was about this until I finally borrowed her copy and was promptly so blown away that I bought my own plus the rest of the series plus the spin-off Glass series. Ms. Snyder could not have been sweeter or more gracious with the time she spent talking to us. I'd worn butterfly earrings because I can't help my nerdiness ever (They were an homage to the Butterfly's Dust poison in the book. I told you I'm a nerd!). Well, Ms. Snyder noticed my earrings and asked if I'd worn them especially for the occasion, and I said yes! Greatest. Moment. Ever. 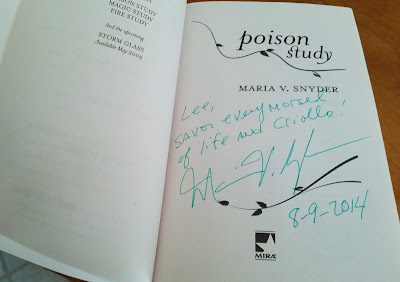 Here's my signed copy of Poison Study, which I shall never let out of my sight. Before I toss the post over to Ally to recount her experience, there's one more thing my inner geek needs to mention. I'd actually been to the hotel that hosted the con, the Buena Vista Palace, about 27 years ago, when I stayed there with my parents during a vacation to Disney. So not only am I a geek, but I'm getting pretty decrepit, too. 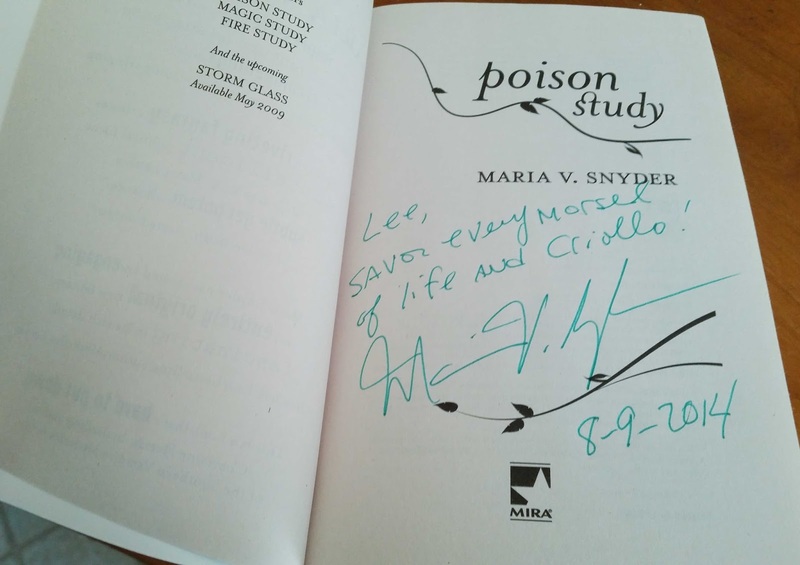 Ally: This past Saturday, Lee and I were able to meet Maria V. Snyder at a book signing in Orlando. Meeting her is probably the best thing that has happened to me all year! Ms. Snyder is one of my top three favorite authors of all time. I was completely star struck while I was talking to her. I must have said "I love you" around a million times and I am so grateful that Lee was with me; she managed to carry a coherent conversation with Ms. Snyder that kept me from looking like a complete idiot. I was a little hesitant to ask Ms. Snyder to sign all of the six books I had brought (I actually own the entire Snyder collection and only decided to get my favorites signed) but she was so kind and gracious about it. 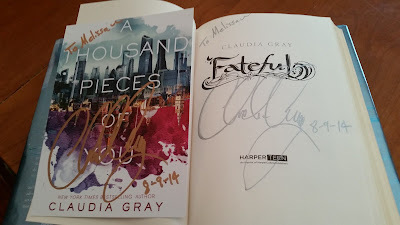 She made sure to sign each book with a colored pen that matched the cover of the specific book, which was beyond awesome! She also talked a little bit about her inspiration behind some of the characters and story lines. The absolute best part was when she gave me a high five; I just about died! Maria V. Snyder was just so nice and terrific; I would love to meet her again. So cool! Jealous of the copy of A Thousand Little Pieces! And jealous that you live in Florida. I want to go to the Disney thing so bad!! Being close to Disney is definitely a perk of living here! The summer temperatures, which have been hot even for us, aren't as much of a joy, though, lol. AHHH! 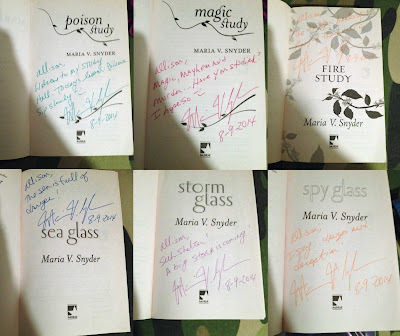 That's so awesome that you got to meet Maria V. Snyder! The Study series is my favorite fantasy series. I'm so happy that she's planning on continuing the series, although no doubt 2015 will take forever to get here. I am envious of you getting to go to a book festival and comic con! I really want to go to both but once the baby is born it will be hard to go anywhere! I did see quite a few baby carriages at the comic con, so there's always the option to attend as a family, lol! If I had kids, I'd totally just make a family outing of it; I don't think it's ever too early to start training them in the ways of the geek! We have had a pretty adventurous summer, especially in the past few weekends. I'm actually looking forward to getting a little breather, lol. Ally and I were just totally starstruck meeting Maria V. Snyder. I'm still kind of in shock that we got to talk to her and got our books signed!